You love kohlrabi. Or beets. Or maybe it's cabbage. The eighth annual Mat-Su Farm Bureau Tour is coming up at the end of the month, and it's a great way to learn about those veggies and plenty more. The full-day tour is 8 a.m. to 5 p.m. July 27 and includes a bus ride from Anchorage to the Valley and back. The tour is sponsored by the Mat-Su Chapter of the Alaska Farm Bureau. "By building connections with the farmers, the hope is that it will reflect in long-term commitment to buying and supporting Alaska grown producers," says Margaret Adsit, owner of Alaska Farm Tours, who is running the tour. 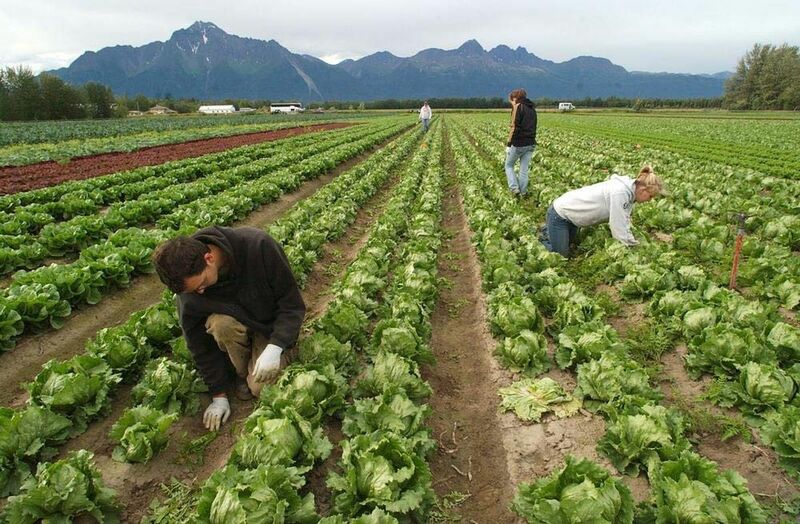 "The centerfold of Alaskan agriculture is innovation and endurance. Alaska can be a challenging place to grow food, but Alaskan farmers have come up with many clever ways to handle those challenges. "This year we are focusing on multigenerational farms and talking about how these farm families have survived through the years." The tour includes visits to VanderWeele Farm, Moonstone Farm, the University of Alaska Fairbanks Experimental Farm, Sunderland Ranch and Bushes Bunches. Lunch is provided at the UAF farm and an agriculturalist will be on the tour. The tour is $65 plus tax and includes lunch and transportation. Those joining it in the Valley can join at the Division of Agriculture building in Palmer. For more information, visit alaskafarmtours.com. Market manager Andrea Trent says about 30 vendors will be at the market on Saturday. "J&J Farms will be placing orders for custom handmade chicken coops, and you'll be able to sign up for a Permaculture Design course through the Alaska Cold Climate Permaculture Institute," she says. Farm vendors include Simple Living Farm, Dinkels Veggies, Brown Dog Farm, Four Turn Farm, Alaska Seeds of Change, Chugach Farm and Ba-Lescas Brothers. New this week are green onions and kohlrabi. Loads of vendors are lined up for the Saturday market, including Rempel Family Farm, which will have green onions and kohlrabi for the first time. Other produce includes snow apple turnips, cucumbers, spinach, arugula, cress, mustard, herbs and other items. Arctic Choice will have king salmon fillets, oysters from Simpson Bay, sockeye salmon, halibut, rockfish, sablefish and other fresh and frozen seafood. Rise & Shine Bakery will be at the market with Alaska potato, spent grain, toasted seed, fresh rosemary and fruited almond sourdough breads. Drool Central will have loads of treats for dogs, including a new "Cohohitos," which owner Daisy Nicolas says includes dried Alaska coho salmon meat and skin. The vendors are lined up for Thursday's market. "Our Cali's Smokey BQQ offers scrumptious and delicious food to eat as you shop. Also this week, we will see handmade woodcraft goods, as well as face painting for children and kids activities with the National Park Service and Food Bank," market manager Mahdi Akal says. Vendors include: Ba-Lescas Brothers, Fresh International Gardens, Seldovitsch Farm, Fire Island Rustic Bakeshop, Eva's Cupcake Bakery, Vang Family Garden, Hodge's Woodshop and Alaska Bug Bites. The Saturday Muldoon Farmers Market will have baklava, baked goods, rhubarb, crafts and loads of vegetables, including salad mixes, tomatoes, radishes, greens, zucchini, bok choy and herbs. Dinkel's Veggies will be at the market with new items, including green beans, potatoes and onions. Other produce includes green and yellow zucchini, strawberries, lettuce, broccoli, tomatoes and pickling cucumbers. In addition to Northway Mall, the Dinkels will be at two markets in Wasilla and at the Anchorage Market and Festival, Spenard Farmers Market and Muldoon Farmers Market on Saturday. Alex Davis is excited to add some fresh vegetables to the market lineup this week, including spinach, kale, snow apple turnips, salad mix, beet greens, Yukon gold potatoes, strawberries and rhubarb. Additionally, Davis will have a full lineup of pork cuts including chops, ham steak, chorizo, sausage, ribs and roast; eggs; and a variety of items from Tonia's Biscotti, Evie's Brinery, Mosquito Mama, Alaska Flour Co. and Alaska Sprouts. "The word this week is peonies! We are bringing the fragrant, delicate and cheerful blooms to market," Farm 779 owner Julie Meer says. "These buds are florist quality clipped, chilled and ready for your creative arrangement skills. Bring a vase along to transport them home from the market." Meer says Farm 779 will also have the blooms at South Anchorage Farmers Markets on Wednesday and Saturday. And she will have ferments and body products with her at all three markets. Country Health Foods will have Alaska Sprouts, featuring broccoli, sunflower, onion, kale, sorrel and bean. Three Bears Farm will have handmade jams, along with fresh eggs. "The long sleep is over! The midseason veggies are rolling in vigorously now," says Sarah Bean of Arctic Organics. That's good news for most. Look for cauliflower, broccoli, zucchini, snow apple turnips, spinach, Toscano and curly kale, chard, beet greens and collards at Saturday's market. Other items at the Arctic Organics booth include lettuces, arugula, greens mix, radishes, pac choi hearts, kohlrabi, rhubarb and herbs. Other vendors include Brown Dog Farm, Ed & Tina's Krauts & Pickles, Happy Valley Chickens' eggs, Mom's Garden, Seldovitsch Farm, Stockwell Farm, Sun Fire Ridge, Turkey Red Café breads and treats, Vang Family Farm and VanderWeele Farm.